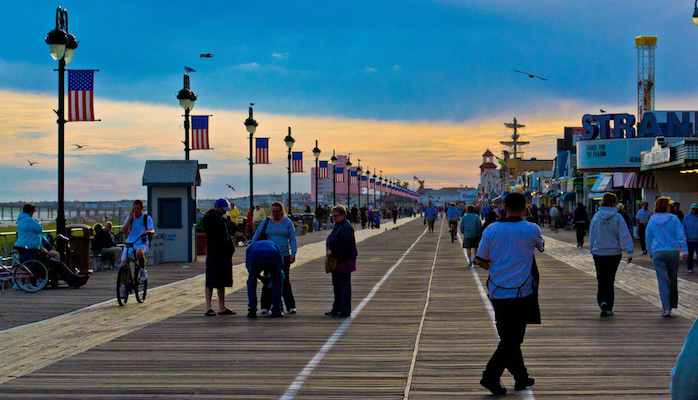 At the far northeast border of Cape May County, Ocean City is a festive waterfront town complete with an old fashioned boardwalk stretching 2.5 miles along the beach. Though it can be busy at peak hours, this is a fun route to people watch while you check out the ferris wheels and junk food stands. You’ll pass a Playland, the Historic Brighton Estates, and Gillian’s Wonderland Pier. The southern terminus of the path starts at the end of 23rd Street, where it runs between the Ocean and Wesley Ave. With two wide lanes, the boardwalk then continues north past a series of piers and parks before terminating at the end of St. James Place. As an out and back, the entire path is about 5 miles. The Ocean City Bike Path is a good nearby option if you want to tack on some more mileage.